This page will talk about how to resize Windows Server 2003 disk partition with partition magic software (IM-Magic Partition Resizer Server). Download IM-Magic Partition Resizer Server to resize NTFS or FAT32 disk partition on Windows Server 2003, SBS 2003. Why do you want to resize disk partition? Is there a partition magic which is able to help resize disk partition easily on Windows Server 2003? Since the release of IM-Magic Partition Resizer Server, many users find it work just like partition magic because it enables them to resize disk partition quite easily. IM-Magic Partition Resizer Server can help with system partition extending, NTFS partition resizing, and FAT32 partition resizing, etc on all Windows Server OS such as Windows Server 2003, SBS 2003 and so on. How to Perform Windows 2003 Partition Resizing? Move the arrow to shrink the selected partition so that you can squeeze some free space, which will be shown as an unallocated volume. Move the unallocated volume close to the partition you want to extend. 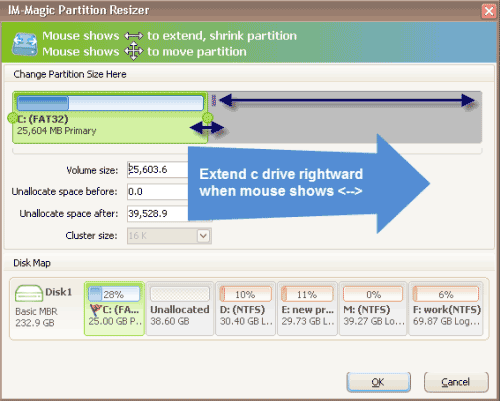 Then right click this partition and choose "Resize/Move" option. Move the arrow to merge the free space to c drive on server 2003, and then click "Apply" button to get the partition extended. Why Need to Resize Partition on Windows Server 2003? 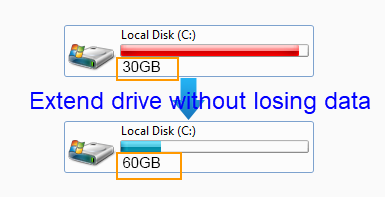 When computer slows down due to low disk space warning on C drive on Windows Server 2003, some people may want to resize disk partition so as to extend C drive to improve the performance of Server. When a disk partition is nearly full and no longer available for storing a large capacity of data, some people may want to increase the size of this partition to optimize the usage of the disk. However, no partition resizing function is built in "Disk Management" on Windows Server 2003 operating system, so a lot of people always feel upset when they need or want to perform hard disk resizing on Windows Server 2003. Since no partition resizing function is built in Server 2003 "Disk Management", Windows 2003 Server users need to rely on a third-party partition resizing tool to resize hard disk partition. Referring to partition software, IM-Magic Partition Resizer Server is most highly recommended due to its good performance, convenience, easy to handle, risk-free and more features. Specially designed for Windows Server users, IM-Magic Partition Resizer Server enables Server users to extend system partition, resize NTFS partition, increase size of FAT32 partition, shrink partition and move partition, etc. Serving as professional partition magic for partition resizing, IM-Magic Partition Resizer Server provides a safe way to get your disk partition resized. This partition magic can extend or shrink partition without touching data on the disk. What is more, this partition magic will not affect the performance of your Server system no matter you resize a system partition or other partition. IM-Magic Partition Resizer Server is also an efficient and time-saving partition magic, because it allows users to resize hard disk on Windows 2003 Server without rebooting the computer. 1. IM-Magic Partition Resizer Server enables users to resize disk partition without having any influence on Server system, while it is complex and often difficult to reinstall Server system. 2. IM-Magic Partition Resizer Server allows you to extend system partition and other partition without deleting or moving any data from original location, while system reinstalling might erase important data on your disk. 3. IM-Magic Partition Resizer Server can help with partition resizing effectively and efficiently in a short time, while it may take a long time to reinstall Server system. 4. IM-Magic Partition Resizer Server provides a secure way to increase the size of partition which runs on low disk space, while system reinstalling can only erase the partition and delete all files on the partition to free disk space. Above all, you don’t need to reinstall system when disk partition is running on low disk space because IM-Magic Partition Resizer Server is able to resize disk partition on Server 2003.